We’ve run out of ways to describe Lionel Messi’s brilliance, but every now and then he extends a helping hand to give us more. Watch that again. López shades toward Messi’s right in an attempt to entice him to shoot that way. With enough whip on the ball and Barcelona teammate Ivan Rakitic clearing some space in the wall, Messi could have done just that. Instead, Messi decided to fire his free kick straight in López’s upper corner. You don’t tell Messi where to shoot. Messi tells Messi where to shoot. 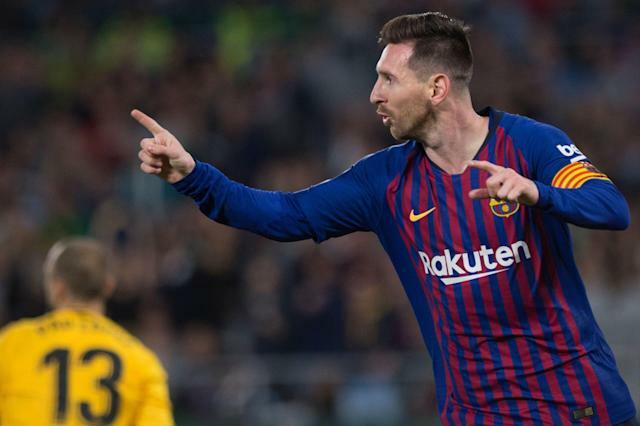 Messi added a third in the 85th minute and Barcelona beat Real Betis 4-1. With Atletico Madrid losing on Saturday, Barca’s lead atop La Liga is now 10 points with 10 to play.